FOMIONE significantly improve pathological changes in pancreatic tissues and increase the number of pancreas β cells. Also increases the number of insulin receptors in the liver of diabetic, improves sensitivity towards insulin and reduces insulin resistance in receptors. Improves glucose transporter 4 genes in bones and muscles. Dosage: 2 Capsules 30 minutes before breakfast, lunch and dinner or as directed by Physician. Take FOMIONE along with the prescription medications. Watch your blood glucose level often. If your blood glucose level is drooping, consult your Endocrinologist and reduce the dosage of Allopathy medicines. After few months you may be able to stop your Allopathy medicines with the consultation of your Endocrinologist and stick on to FOMIONE. If you still notice blood glucose is drooping, reduce FOMIONE to 1 capsule before each meal. Diabetes diet should have the ratio of 60:20:20 for carbs, fats and proteins. Daily calorie intake should be between 1,200-1,500 calories with a proportion of 60:20:20 between carbohydrates, fats and proteins. Add two seasonal fruits and three different vegetables in the diet plan. Take fresh fruits rather than dry fruits for controlling hyperglycaemia. High fructose in dry fruits can spike your sugar level. Fruits with high in fibre such as papaya, apple, orange, pear and guava should be consumed. Other fruits like grapes, mangoes and bananas should be consumed lesser or avoid because they contain high fructose. To prevent high and low blood sugar value fluctuation, it is better to take small meals frequently. Dhokla, fruit, high fibre cookies, butter milk, yogurt, upma / poha and boiled vegetables would be a perfect snacks. Avoid artificial sweeteners. Most of the artificial sweeteners are made with Aspartame and increased risk of cancer, including a significantly higher risk of leukemia. Avoid artificial sweetener brand names Splenda ® , NutraSweet® and Equal® as they contain Aspartame. Also artificial sweeteners can increase appetite and maintain cravings for sweet food. Avoid carbonated drinks as most of the carbonated drinks uses Aspartame as sweetener. Stevia or Xylitol are safer substitute sweetness. Xylitol is a sugar alcohol with a sweetness similar to sugar and Stevia is a sweetener and sugar substitute extracted from the leaves of the plant species Stevia rebaudiana. In non-vegetarian diet, seafood and chicken can be taken rather than red meat. The red meat contains higher amount of saturated fats. Also, patients with high cholesterol should avoid egg yolk and red meat. Diabetic patients should limit alcohol consumption. A person with diabetes should follow a diet which is low in carbohydrates, high in fibre and contains adequate amounts of proteins, vitamins and minerals; and avoid fatty foods and sweets. Apples, Avocado, Barley, Beans, Berries, Broccoli, Carrots, Chicken or turkey, Eggs, Fish, Flaxseed, yogurt, Nuts, Seeds, Oatmeal, Olive oil, Peanut butter, Whole-grain bread and Sweet potatoes. 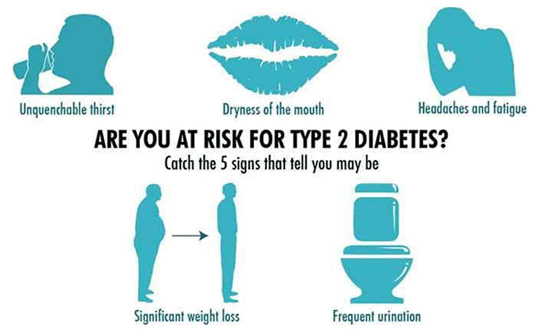 When you have type 2 diabetes, physical activity is an important component of your treatment plan. Increase activity in general such as walking or climbing stairs rather than a particular type of exercise. Exercise can reduce the glucose in your blood. Muscles can use glucose without insulin when you’re exercising. 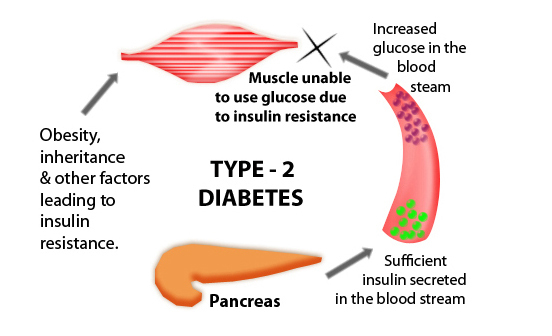 In other words, it doesn’t matter if you’re insulin resistant or if you don’t have enough insulin: when you exercise, your muscles get the glucose they need, and in turn, your blood glucose level goes down. 6 Exercises for People With Diabetes- Other than walking most of them are indoor exercise. Aerobic exercise - Examples of aerobic exercises include cardio machines, spinning, running, swimming, walking, hiking, aerobics classes, dancing, cross country skiing, and kickboxing. This Proprietary Ayurvedic Medicine is derived and time tested by Chavarcode Ayurvedic physicians. Helps regulate glucose & lipid metabolism, reduce chances of triopathic complications due to persistant high blood glucose & tone functions of pancreas. FOMIONE significantly improve pathological changes in pancreatic tissues and increase the number of pancreas β cells.